Our absence policy is as follows. You get one missed session over the 12 week program. After the allowed total missed sessions, any subsequent absences count as an attended class. What does my child need to bring to class in order to be prepared? Please have them bring a water bottle, sunblock, proper clothing for the current weather, summer or winter and clubs if they have them. Golf shoes and gloves are not necessary. How do I find out which program is right for my child? On the sign up page you will see the groups are age and skill level specific. Inside each team we then group players who are comparable in ability. Your child will feel comfortable in the session and increase their learning ability by being paired with other players of similar skill. What’s included in the Junior program? •	1.5 hours of coaching weekly •	One on course playing lesson per month •	Video Analysis •	Logo hat. We try and hold class as much as possible so please be prepared to bring them even if it is raining. We will only cancel class if the range is closed or if the weather is REALLY bad. If we do end up having to cancel class due to inclement weather, no sessions are lost. In bad weather, sessions are held inside where we will work with the students on club handling games (putting, chipping). Our coaches will also work on theory based curriculum. All sign ups are online, making it easy, quick and reliable. Just choose the program you wish to sign up to and follow the prompts. Does my child need clubs? 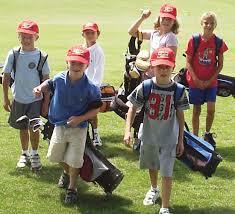 If your child does not have clubs please let us know and we will provide them. If your child has clubs please bring them to class so we can make sure they are fitted properly. If you'd like to buy equipment for your child, we stock and supply children's clubs from US Kids Clubs. I came to NZ for a month and Kerryn was my coach. I went back to Hong Kong and won, I couldn't believe it. I shot 40 the last two tournaments. I just shot 36, so happy to go back to the 135 meters now. I am so excited I just shot 38 from the 90 meter marker in the tournament and now I am white hat advanced level. We will contact you once we have received your information. At Kerryn Jamiesons Golf our goal is to give juniors the coaching, instruction and positive support needed for them to improve their games and to grow as individuals. We believe that golf gives juniors of all ages and skill levels, the opportunity to learn valuable life skills and build character. We believe that for juniors to get the most out of the learning experience the coaching must be positive, fun, full of interaction and be personalised. This means we keep our group sizes small and have players of the same ages and skill levels learn together.